Off To The Vets Again! I love my Snow, she literally means the world to me and tomorrow she goes under anesthetic again. And she seems to be handling this news a lot better than me! This morning I bathed her and Chestnut before work and you could see all the more, how much weight she has lost. Although her eyes and still bright and she is still strong inside and feisty – pushing past Chestnut at times and trying to climb out of the sink I bathed her in this morning. This is a recent picture of her before the most dramatic weight loss over this week. On Friday she was dropping some piggie mix from her mouth and coupled with the weight loss, I felt it was best to get her to see a vet that day. 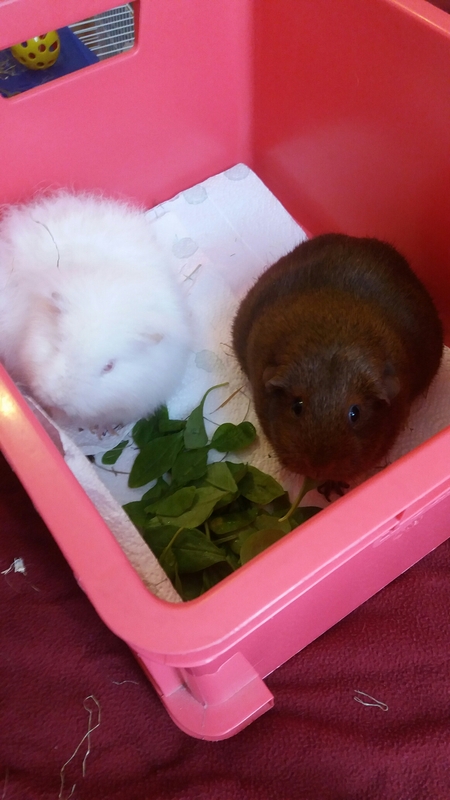 Chestnut always goes with her – good job, as Snow was diagnosed with mites aside from possibly her teeth being overgrown again and confirmed weight loss. She was 1kg on 31st May, now 8.08. But both have to have mite treatment and Chestnut has to be weighed for this too. The vet could not see Snow’s teeth for the tongue being attached to her cheeks so tomorrow the head vet will anesthetise her to take a closer look at what is going on! I pray it is nothing worse and that Snow will be okay. I am feeling sad now so going to say write soon and always follow your heart!